This post is based on a webinar we hosted! Click here to watch the full video replay. How Strong Is Your Patient Referral Program? 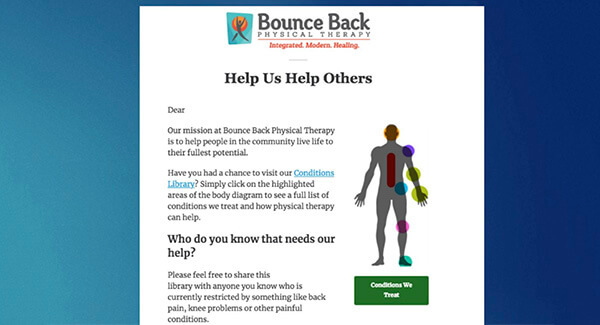 Physical therapy referrals are one of the longest-standing staples of PT Marketing success. While direct access continues to grow, the most compliant patients and those most likely to complete their care plan come from referrals. Possibly the biggest advantage of referred patients is the low cost-of-acquisition (simply, how much money you spent to turn them into a patient). Once your relationships and networks are built, all a referral costs is a conversation! Building these processes can take time, but with a few simple techniques, they can be fruitful for many years to come. Think about it like investing – small steps which become a habit over time begin to build upon their own success. However, beware that every good program will trend downward if it isn’t consistently trained and focused on. You should have a staff member designated to be head of the referral program so that they can steadily encourage the other staff members to apply the successful steps below. For more tips on attracting new patients with Social Media, Emails, SEO, Websites, & more check out our free PT Training Downloads! The key to a good referral system is it must be about your mission to help people feel better. Getting your staff on board can be one of the toughest aspects of referral generation for a PT Owner. No therapist wants to try and act as a sales rep, and patients don’t want to be sold! It is important to remember that helping is not selling when it is genuine and caring. PT’s love helping people – it’s what our careers are about! As an owner, it’s important not to push policies on your staff but instead RALLY them behind the mission of your practice. When everyone stays focused on finding more people who need help getting off medication, avoiding unnecessary surgery, playing with their kids or grandkids, or getting back to sports, referrals become natural conversations instead of sales pitches. That’s a tip Jamey Shrier, PT of the Practice Freedom Method gave us on a recent webinar we hosted, “Automating Physical Therapy Referrals for Your Practice.” You see, generating referrals is vital to growth. We all know that, but as a practice owner, you can’t spend half of your week working on it. Instead, you need a clearly defined process your entire staff can be trained to fulfill. 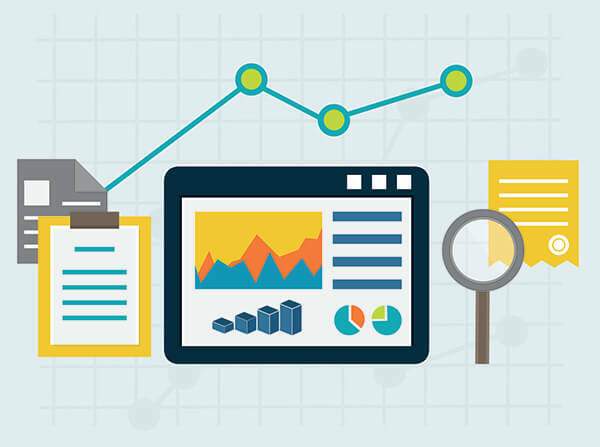 Understand what referral methods work best for your practice. If you don’t have the history to determine this, read about what works well for other practices and start there. Type out your referral system as a guide for your staff. Make it clear and simple then, after you go through training (step 4), post it in key staff areas. Clearly state the necessary materials for the process such as referral cards or brochures. Also, make sure one person is in charge of reordering and understands the procedure. Get your staff on board. Host a training for your new system. An off-hours event with team building activities works best so nobody is distracted by other duties. Again, keep it strongly purpose driven. 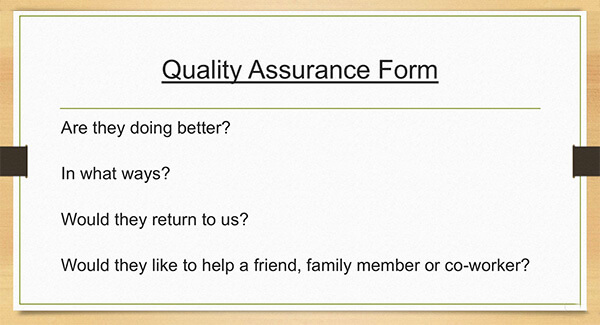 Here’s a great process example from the Automating Referrals Webinar: The Quality Assurance Form. How are you doing, are you feeling better? What specific ways are you feeling better? Would you return to us for future pain issues? Would they like to help someone they know feel better as well? Most of us can think of a friend or family member who doesn’t feel perfect. When they begin to talk about someone, ask for specific issues and offer them a brochure or newsletter to pass along that covers the topic. Also, if it is a family member, allow them to bring them on their next appointment for a free conversation about their pain and treat it like a mini-evaluation. These steps build upon the patient’s happiness with their results, and build trust in the referral. Focus on each step a patient takes during their time with your practice. You can’t generate referrals if your customer experience is just normal. When was the last time you ran out to tell all your friends about an experience you had that was “as-expected?” Sure it didn’t let you down but does it even cross your mind to share unless something stands out? From the front desk to the waiting room to their treatment, each interaction with your staff and your facility offers an opportunity to impress and educate your patients. Sure, word-of-mouth can spread from just quality treatment, but it spreads faster when you encourage, educate, and empower your patients to make referring easy. First, when a new patient joins be sure to introduce them not only to their care but also what it is you do as a physical therapist. Face-to-face time with success stories, tours of your facility or staff, new patient packets with information on a variety of treatments – all of these simple steps can be the difference between a patient, and a physical therapy ambassador. Your mission is helping people live pain-free naturally. Help them catch that vision! Patients are busy like you; even with the best experience, they won’t go too far out of their way to get someone to you. Give them tools! That’s why the next step is empowering easy referrals. Make it easy to pass information to others. Patients may not know which of their friends need your service right away, but when it comes up in conversation they are very likely to pass along a brochure or a referral card especially if it includes a free consult. Make sure each patient receives at least 1 when they complete their treatment. Your website and emails can also help patients refer their friends. Schedule automated follow-up emails once a patient is feeling better. Include a link to your website that has condition information that can be forwarded to a friend. Want to encourage them a little more? Offer a gift card to the referring patient and the new patient so they are more likely to hold onto the literature you give them. Keep this offer consistent and market it across all patient materials. 60-65% of your patient volume should be repeat patients or patient referrals. Imagine 1 of every 3 patients replaced themselves. What if 1 of those 3 also came back? Your patient volume would BOOM! A vital habit of referral-generating practices is past patient marketing. Emails, Social Media, Newsletters, and other mailers should be second nature to your marketing plan to keep your practice top-of-mind. First, when the patient has just completed care be sure to send an email request for a review. Online reviews create a trusted image for prospects looking into your services and allow you to utilize the patient’s referral even if they never tell another friend. Next, market the same referral system mentioned before in every newsletter, regular social media posts, and occasional special mailers. Your previous 3-5 years of patients could be a goldmine of referrals. In addition, utilize email as a digital referral card. Send an email with an ebook or information about the benefits of PT and encourage your patients to forward it to their friends. Include a link to your website and the same referral incentive you do on your cards. Professional business relationships are a great way to supplement your direct access patients. Create Specific Brochures for referral partners and leave them with the doctors and office staff. It takes time, but friendly, consistent networking can build a strong core of patient growth for your practice. Be friendly, be educational. 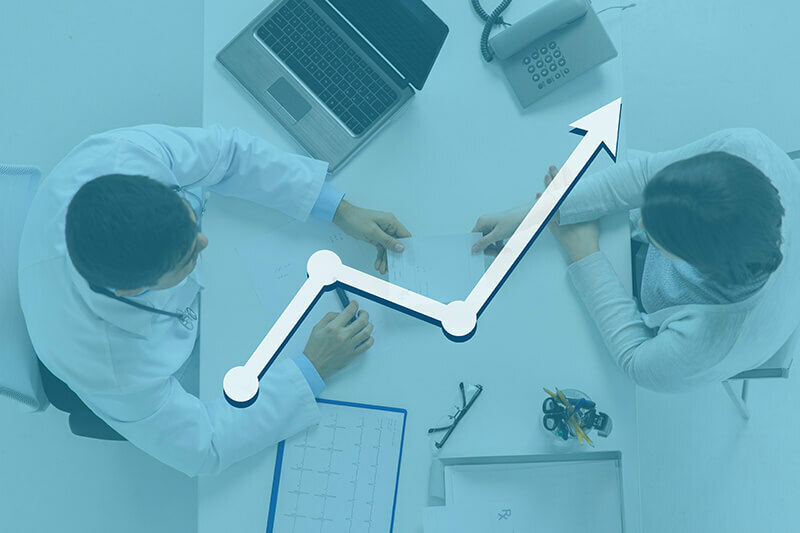 And while face-to-face is critical, there are some great modern tools to use in your physician marketing – Check out these 5 tips to increase physician referrals. Physicians aren’t the only local businesses you can gain referrals from. First, get together with your experienced staff members and brainstorm local partnerships where your client base also spends time. Some examples might be Gyms, Health & Wellness Shops, Arthritis or Other Condition-based Support Groups, or Sports Groups, Schools, etc. Next, create specific printed materials to leave at each of those places with messaging to connect with their specific customers. Every practice owner needs to know what is working. The final and most important point we can make is to pay attention to the return and investment you make in each of these areas. One area working well? Consider ways to put more resources into growing it. Is there a relationship underperforming this month? See how you can rebuild it. For more expert referral training, check out the full webinar featuring Jamey Schrier, DPT. Watch it here!